Ever since the blast of cold air came down from the northwest on Monday night (1-31-11), Dallas has been like a freezer. My employer, UT Dallas has closed the campus Tuesday, Wednesday and Thursday so I have been home for days. In these three days I have ventured out only three times from the house. Once to drop Ruthie off at her parents house so they could slide out of Dallas on the way to Florida, once to take my son Jon Jon and my mom to lunch and once to go to the grocery store for supplies. It has been bitter cold, like 14-18 degrees most of the time. There are sheets of ice everywhere and walking is even more dangerous than driving (at least I think so). The only ones that seem to be enjoying running around outside and that don’t really come zipping back in two minutes after going out – yup, it our two doggies, Allie and Tasha. 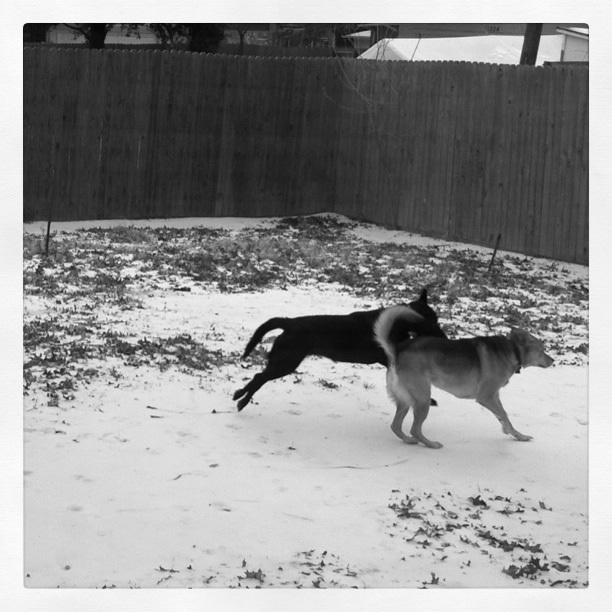 They have been enjoying frolicking around in the backyard on the crunchy ice. Hey, at least it’s not muddy so we don’t have to clean up after them when they get back into the house. Any fun ice/snow stories you would like to share? I know Dallas is on the trail end of this massive storm system that has gripped much of the nation, and it would be neat to hear from people in other parts of the country. ← What is the Glif & why should you care? Just saw jon pin his wrestling opponent! Is this Lebanon or Syria? An offer on the Maribeth house!